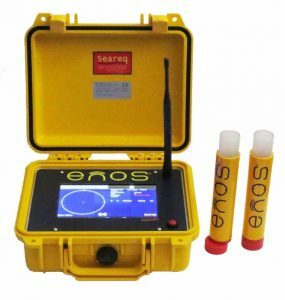 ENOS® is a short cut of the German product description“elektronisches Notruf- und Ortungssystem”, it is an Electronic Rescue and Locating System. 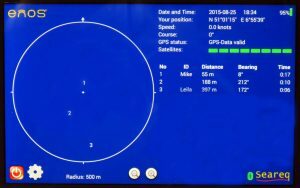 It is an emergency system for divers (and other water sports) which supports the search at the surface for missing people. ENOS® is a registered trade mark.The ENOS®-System consists of two components: one, the ENOS®-Receiver aboard the dive boat and the other, the ENOS®-Transmitters which are carried by the divers during the dive. Time and again it happens that divers are coming up to the surface too far away from the dive boat. Too far, for swimming back. Due to strong current the divers drifted far away into the open water and something they can easily overlook. Large-scale search operations are the result, not all end successfully. To give signals in this dangerous situation and to become rescued, the ENOS®-System was developed. Where are the benefits, especially for divers? The ENOS®-System ist the first rescue system which offers transmitters pressure proofed up to 100 metres depth. The switch of the ENOS®-Transmitter is easy to handle – even with gloves on. Thanks to its technology, the ENOS®-System is independent of support from the coast (where data of emergency calls have to become evaluated first prior starting the rescue operation). Therefore the ENOS®-System operates worldwide: even at remote areas.